168: The number of lives lost in the bombing. Born on April 23,1968 "Timmy" McVeigh was a well mannered, energetic child who most of his neighbors liked. McVeigh grew up in the kind of neighborhood that you read about: Blue collar, christian, small town, right by the Canadan border. Although McVeigh was close with his father Bill it was his grandfather Eddie that he most looked up to. Eddie taught Timmy the art of camping, fishing, and other outdoor sports, but most importantly, hunting. At the age of 9, Timmy got his first taste of preparing for an enemy when he learned to stock pile food for a blizzard that hit his town. The enemy was the weather and Timmy knew he needed to be prepared. When McVeigh turned 13 his grandfather presented him with the first of many guns he would own, a .22 caliber rifle which he would often take to school to impress his friends. In 1986 McVeigh's mother, Mickey, left Bill and her son to enjoy a more party-going lifestyle. They devorced shortly thereafter. McVeigh graduated highschool with honors that same year. After highschool, McVeigh quit his job at a local Burger King and began to study the Second Amendment, the right to bear arms. He became facinated by gun control laws and the rules and regulations that controled gun owners. It was at this time that he found and began reading a book called The Turner Diaries, a book written by William Pierce who was a former American Nazi Party official. Pierce had written the book under the pen name of Andrew Macdonald. Through this book McVeigh learned of the main charcter's contempt for gun control laws, and shows it by truck-bombing the Washington FBI headquarters. McVeigh also became interested in the movie Red Dawn, inwhich the main charcters must arm themselves to defend their country against terrorists who invade the United States. McVeigh began to believe that he needed to be ready for anything and decided it was time to stock up on supplies, weapons and ammo. At age 20 McVeigh became a security guard for a armored car company. This job allowed him to carry a gun and drive in armored vehicles, but McVeigh wanted more. On May 24, 1988 McVeigh joined the Army. He became aquainted, durring basic training, with two other men who shared his military ideals and joined him on his path to terrorism. Terry Lynn Nichols and Michael Fortier were the men that befriended McVeigh. Nichols was 12 years older than all of the other men in the training and eventually left the Army, when his wife left him, to be with his young son. Mc Veigh then became close to pot-smoking-pill-popping Fortier. Mc Veigh was seen by his superiors as an excelent soldier who was well focused and very accurate with any weapon he handled. Mc Veigh loved the Army and the decipline it had to offer. He had set his sights on becoming a Green Beret. After much training, McVeigh was ready to take the test, when his country came calling. 1991 marked the begining of the Gulf War and McVeigh was off to it. McVeigh quickly earned the posision of lead gunner on the Bradley Fighting Vehicle in the first platoon. Apon his return home, McVeigh won many decorations, among them the Bronze Star. He began retraining to join the ranks of the Green Beret, but failed to pass the test, as he had lost much of his stanima and vigor in Desert Storm. He quickly became uninterested in military life and quit the Army. As he tried to adjust to civilian life, McVeigh quickly realized that the world wasn't interested in hiring a decorated war vet, and became more and more dissatisfied with the government that he once served. He became a security guard again and it was durring this time that he told a co-worker that it would be easy to steal weapons from a military compound. He said that he knew of an Army post where M-16s could be confiscated. It was also durring this time that McVeigh renewed his interest in The Turner Diaries. McVeigh found life outside the Army to be unfulfilling due to his lack of discipline that the Army had offered him. In 1993, McVeigh left his job as a security guard and began to search the country in search of himself. He packed up all of his belongings and soon hit the road. He decided to look up some old friends and found Michael Fortier in Kingman Arizona. He then looked up Terry Nichols who was in Michigan staying on a farm with some family. The final straw that snaped sending McVeigh on a collision course with Oklahoma happened when in February 28, 1993 when he saw something that interested him in the news. A religous group called the Branch Davidians found themselves in a hold up in Waco Texas. McVeigh began to believe that their right to bear arms was being imposed and wanted to go to Waco to help in any way he could. He stocked up on anti-government pamplets, leaflets, and bumperstickers. He wanted to get a look at the compound but was denied access by police so he began handing out the propaganda. Durring this time, Michelle Rauch talked McVeigh into an interview. McVeigh told Rauch "The government is afraid of the guns people have because they have to have control of the people at all times. Once you take away the guns, you can do anything to the people, The government is continually growing bigger and more powerful, and the people need to prepare to defend themselves against government control." Afew days later he left Waco, moved to Kingman to stay with Frontier, but soon moved to Tulsa, Oklahoma, home of one of the worlds largest gun and knife shows. McVeigh loved attending these shows and they lifted his spirits. It was at one of these gun shows that McVeigh met a man by the name of Roger Moore, who used the show name of Bob Miller. Moore invited McVeigh back to his ranch home which was nothing short of a military compound. There McVeigh found Bombs, Guns, Knives and every other weapon he could imagine. He went back to visit with Terry Nichols. It was there that McVeigh and Nichols learned of the fall of the Waco Compound and decided that something must be done. Once McVeigh came up with the plan to bomb a government building, he tried to get his old friend Frontier involved. Frontier refused but Nichols accepted. Nichols and McVeigh soon came up with a decent plan and began building their bombs. At one point Nichols robbed Moore to get many of the suplies that they needed to pull off their "job". In October of 1994, McVeigh had to slow his plan after learning of the death of his beloved grandfather. McVeigh returned home to help sort out his grandfather's estate and Nichols headed to the Philippines to visit his family. In December of 1994, McVeigh met up with Nichols where they finalized their plans. McVeigh drove Nichols past the building he planned to bomb and along the escape route he planned to take. "The getaway car would be his 1977 yellow Marquis since his other car had been damaged in an accident. The plan was for Nichols to follow the car in his truck. After McVeigh parked it away from the bombsite, they would drive back to Kansas. The night before the bombing, they left the Marquis after McVeigh removed the license plate and left a note on it saying it needed a battery. Then, they drove away and Nichols dropped him off at his motel. McVeigh pulled his rider truck into the parking lot of the Alfred P. Murrah Building at 9am and casually walked away, puting earplugs in his ears to protect from the blast. at 9:02am the bomb detonated causing the worst disaster ever caused by an american terrorist in history. The 4000-pound explosive destroyed 1/3 of the building causing mass carnage and chaos. People were burned alive as the explosion tore through the building killing woman, children, federal workers and civilians alike. McVeigh was safely on his way up the highway when he was pulled over for not having plates on his car. The officer noticed a bulge in his shirt and when asked, McVeigh admitted it was a gun and he had the right to bear arms. The officer then informed him that his New York concealed-weapon permit was not legal in Oklahoma and confinscated the 9-mm Glock and an ammo clip. McVeigh left a card in the patrol car. A nice little business card that had been supplied to him by Dave Paulson. On the back of the card, McVeigh had written: "TNT $5/stick need more. Call after 01 May, see if I can get some more." McVeigh left the card a payback for a deal that had gone bad earlier in the year. McVeigh was booked for unlawfully carrying a weapon, transporting a loaded firearm in a motor vehicle, failing to display a current license plate, and failing to maintain proof of insurance. McVeigh's hearing for the charges would be held over untill May 21. FBI worked quickly and, with the help of a psychological profiler, a witness at the hotel and the rider truck company, tied McVeigh to the bombing. "In jail, McVeigh was in a waiting area near the courtroom when the sheriff received the news the bomber was in his custody and to hold him. McVeigh’s trial was due to start soon. Suddenly, officers came to lead him back to his cell. They were playing it cool; saying only, “the judge isn’t ready for you.” Back in his cell, another inmate asked McVeigh if he was the bomber. Reportedly, McVeigh ignored the question. Knowing the suspect would try to contact a lawyer, the outgoing pay phone was disconnected. Outside, the noise was building as a restless crowd gathered. The arrival of helicopters and police had signaled that someone involved in the bombing was inside. The Jury took only 3 days to convict Timothy McVeigh of the bombing and sentenced him to die. McVeigh was sent to the Florence, Colorado federal prison known as "the Supermax." There inmates included the names of such major killers as: " Ramzi Yousef, who masterminded the World Trade Center bombing on February 26, 1993 – a crime that killed six and injured more than 1000. His sentence approached 250 years. It was his crime that initially led investigators to assume the Murrah building was an act of foreign terrorists. Ted Kaczynski – the notorious Unabomber – serving 4 life sentences for mail bombings. He was the intellectual in the group. The last member of this unsavory quartet was the only non-bomber –Cuban born Luis Filipe. Dubbed “King Blood, he’d headed a notoriously grisly NYC street gang. "I, Timothy McVeigh, hereby certify; that no abuse has been inflicted upon me while I have been in the custody of the U.S. Bureau of Prisons. I hereby waive any claim of such abuse." He also asked that his father not attend his execution and his father had agreed stating that he did not wish to see his son die. What McVeigh did was just wrong. I still remember where I was when I heard over the radio that he had been executed. I was in the car with my grandfather and I remember him saying, "Amen." At the time I didn't understand. Now I do. McVeigh once said that he alone held all the pieces to the puzzle and that he regreted not assasinating police officers and government officials instead. He also claimed that in his personal battle against the government, he felt he was the victor. McVeigh made a final statement before his execution. 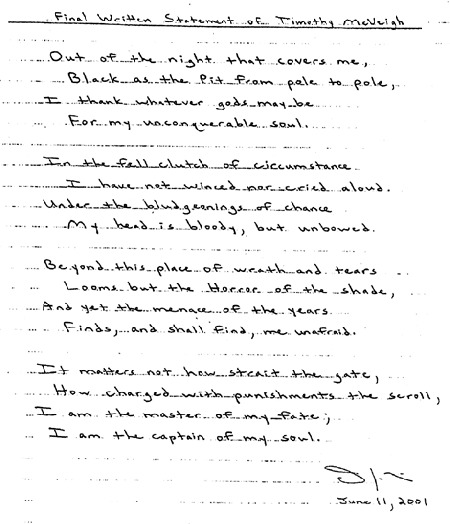 It was in the form of a poem by William Ernest Henley titled Invictus. Below is a copy of that statement. Click on the poem to read a typed version of Invictus.